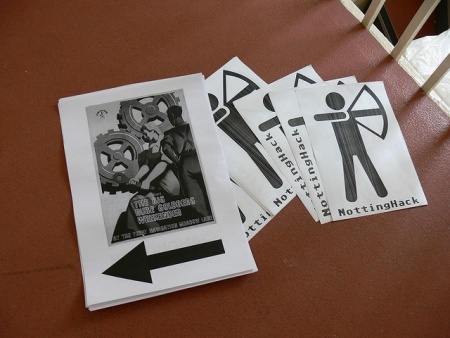 Founded in March 2010 to provide community workshop space to the people of Nottingham, Nottinghack has since become one of the premiere hackspaces in the UK. The first meeting consisted of three people that decided to organise a 'show and tell'; where makers show each other projects that they have been working on. Thirty to forty people attend the show and tell. The first meetup of what would become Nottingham Hackspace occured at 7pm, 10th March 2010 at Ye Olde Salutation Inn, Hounds Gate. 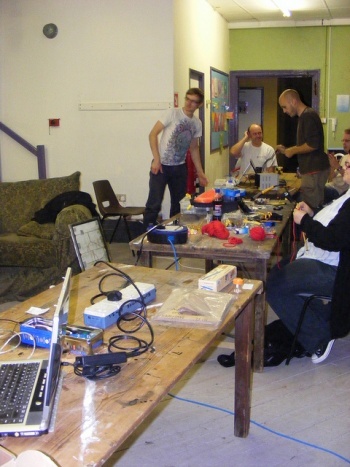 The first Nottingham Hackspace was based inside the The Art Organisation. It started as just one storage room, but expanded into a small workshop with a larger office space. Hackspace 1.0 was located at The Art Organisation (TAO). Nottinghack first rented a store room in The Art Organisation (TAO). Open Hack nights were held in Hackspace 1.0 and still are today at our current location! When we first learnt that we were being evicted from Hackspace 1.0 we initially planned to move into the basement of The Art Organisation, which had no windows. After that fell through, number of other locations were considered, including Queens's Bridge Road and Nottingham Co-Operative Society Bakery. Finally, Roden House near Sneinton market was chosen. Work on Hackspace 2.0 started back in 2011. When we moved into the space it looked very different to how it does now. The images below show the space between 2011 and 2012. Nottinghack continued to acquire more tools, even more members and lots of experience. We've come quite a way! On Sunday 29th May 2011 we held the first Big Open Day Event as a celebration of the new Hackspace "2.0" and a publicity/recruitment opportunity. It was a great success, attracting many visitors and new members. In 2012, many workshops were held on a wide range of subject including soap making, design, electronics, homemade wine etc. 2013 saw even more workshops including solar power, lock picking and building a toy car. Work on Hackspace 2.5 started after a decision to proceed with the project at the AGM on 2015-12-03. 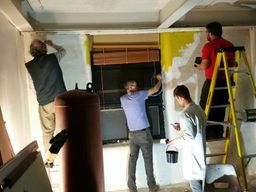 A dedicated team of members started working on the space every Tuesday night since the keys were acquired to the unit. Some of the work is documented on the Hackspace 2.5 Project page. As of February 2019, work was still being carried out to fully fit the space. However, the CNC Area, Electronics Area and Blue Room were open for business. Help still needed! Join the Hackspace 2.5 slack channel or read more on the Volunteering page. This page was last modified on 22 March 2019, at 19:41.